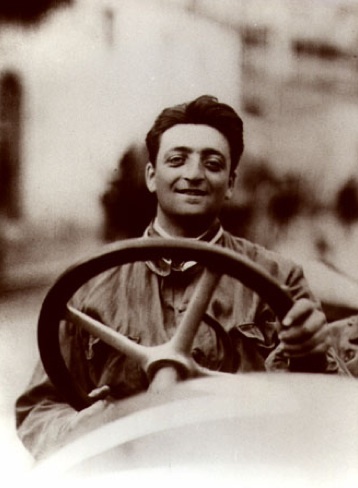 Enzo Ferrari (1898-1998) was born to the sound of engines in his father's workshop in Modena. He saw his first car race in 1908, and knew then and there he wanted to be a driver. After serving in the First World War, he got his first chance with C.M.N. (Costruzioni Meccaniche Nazionali) in Milan, and in 1920 went over to Alfa Romeo's factory team. Enzo had been a great friend of Italy's World War I flying ace Francesco Barraca (who died in a mysterious crash in 1918), and in 1923 his mother gave Enzo the famous Prancing Pony badge salvaged from his plane. It would be Ferrari's talisman: not only after he won his first race, the Coppa Acerbo at Pescara. Although he continued to race until 1932, he soon after began working in the Alfa shop, preparing race cars and managing drivers. In 1932 Enzo started his own racing team or 'stable', the Scuderia Ferrari, with Alfa Romeo; in 1935, his star driver, Tazio Nuvolari, won at the German Grand Prix. In 1937, when Alfa took back control of its racers, Enzo decided it was time to move on. Unable, according to his contract, to use his own name for four years, he called his company Auto Avio Costruzioni, and built his first two cars (one of the survivors is now in the Collezione Righini) in time to race in the Mille Miglia of 1940. Then came the war, when Auto Avio Costruzioni was compelled to manufacture parts for Mussolini's war machine, until the factory was bombed. Enzo moved operations outside Modena to Maranello and in 1947 started building race cars under the Scuderia Ferrari name, and it wasn't long before he began winning races. He signed on to Formula 1 when it was founded in 1950, and in 1953 began to build sports cars to finance his racing passion. Ferraris would win Le Mans nine times betwen 1949 and 1965, the Targa Florio seven times, the cross Italy circuit Mille Miglia classic eight times, and Formula One four times between 1956-64. The darkest moment in Enzo's career occurred during the last Mille Miglia race of 1957, when Ferrari driver Alfonso de Portago, travelling at 250 km/h, blew a tyre (Portago had waited too long to stop for a change) and crashed into the roadside crowd at Guidizzolo, killing de Portago, his co-driver and nine spectators. It was the end of the Mille Miglia race and Ferrari and the tyre maker were charged with manslaughter; the case was finally dismissed in 1961. In the 1960s, Ferrari was under financial pressure. After rejecting a takeover bid from Ford, Enzo sold half his company to Fiat in 1969, with the proviso that he kept control of the racing division. Known as 'il Commendatore' and increasingly 'il Grande Vecchio' (the Grand Old Man), he rarely travelled outside of Modena and Maranello, except for the annual Italian Grand Prix at Monza, although he did leave this short interview video before he died at age 90 in 1988, having launched one of his greatest cars, the Ferrari F40. After his death, Fiat took over the company except for the ten percent belonging to the Ferrari family. Between October 2015 and January 2016 Fiat sold off its shares, and today the company floats on its own on the stock market (with Enzo's son Piero Ferrari keeping his ten per cent stake). It has been rated one of the world's strongest brands—there's even a Ferrari World Theme Park in Abu Dhabi.